Lawrence Berkeley National Laboratory scientists have developed a new “magnetoelectric multiferroic*” material that could lead to a new generation of computing devices with more computing power while consuming a fraction of the energy that today’s electronics require. “Electronics are the fastest-growing consumer of energy worldwide,” said Ramamoorthy Ramesh, associate laboratory director for energy technologies at Lawrence Berkeley National Laboratory. Global or world energy consumption is the total energy used by all of human civilization. The U.S. Energy Information Administration estimates that in 2013, world energy consumption was 157,481 terawatt hours (TWh), mainly from polluting expendables — oil, coal, and natural gas. The new material, which combines electrical and magnetic properties at room temperature, could help reduce this consumption in the future. The newly developed material sandwiches together individual layers of atoms, producing a thin film with magnetic polarity that can be “flipped” from positive to negative or vice versa with small pulses of electricity. In the future, device makers could use this property to store digital 0’s and 1’s, the binary backbone that underpins computing devices. Room-temperature multiferroics are a hotly pursued goal in the electronics field because they require much less power to read and write data than today’s semiconductor-based devices. In addition, they are nonvolatile (their data doesn’t vanish when the power is shut off). Those properties could enable devices that require only brief pulses of electricity instead of the constant stream that’s needed for current electronics, resulting in using an estimated 100 times less energy. To create the new material, the researchers started with thin, atomically precise films of hexagonal lutetium iron oxide (LuFeO3), a material known to be a robust ferroelectric, but not strongly magnetic. Lutetium iron oxide consists of alternating monolayers of lutetium oxide and iron oxide. They then used a technique called molecular-beam epitaxy (which takes place in a high vacuum) to add one extra monolayer of iron oxide to every 10 atomic repeats of the single-single monolayer pattern. While Heron believes a viable multiferroic device is likely several years off, the work puts the field closer to its goal of devices that continue the computing industry’s speed improvements while consuming less power — replacing current silicon-based technology. The research was published in a paper in the Sept. 22 issue of Nature. It was supported by the Department of Energy’s Office of Science. * The magnetoelectric effect is the phenomenon of inducing magnetic or electric polarization by applying an external electric or magnetic field. “Ferroics” is the generic name given to the study of iron-based ferromagnets, ferroelectrics, and ferroelastics. These materials exhibit large changes in physical characteristics that occur when phase transitions (such as paramagnetic, or temporary magnetism, to ferromagnetic, or permanent magnetism) take place around some critical temperature value. Multiferroics exhibit more than one ferroic property simultaneously. Materials that exhibit simultaneous order in their electric and magnetic ground states hold promise for use in next-generation memory devices in which electric fields control magnetism. Such materials are exceedingly rare, however, owing to competing requirements for displacive ferroelectricity and magnetism. Despite the recent identification of several new multiferroic materials and magnetoelectric coupling mechanisms, known single-phase multiferroics remain limited by antiferromagnetic or weak ferromagnetic alignments, by a lack of coupling between the order parameters, or by having properties that emerge only well below room temperature, precluding device applications2. Here we present a methodology for constructing single-phase multiferroic materials in which ferroelectricity and strong magnetic ordering are coupled near room temperature. Starting with hexagonal LuFeO3—the geometric ferroelectric with the greatest known planar rumpling—we introduce individual monolayers of FeO during growth to construct formula-unit-thick syntactic layers of ferrimagnetic LuFe2O4 within the LuFeO3 matrix, that is, (LuFeO3)m/(LuFe2O4)1 superlattices. 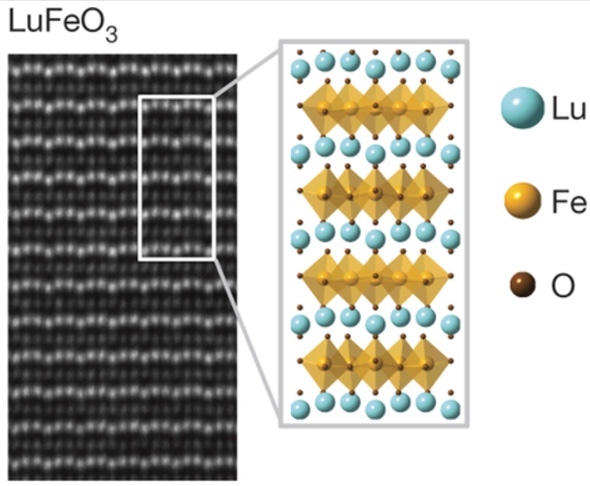 The severe rumpling imposed by the neighbouring LuFeO3 drives the ferrimagnetic LuFe2O4 into a simultaneously ferroelectric state, while also reducing the LuFe2O4 spin frustration. This increases the magnetic transition temperature substantially—from 240 kelvin for LuFe2O4to 281 kelvin for (LuFeO3)9/(LuFe2O4)1. Moreover, the ferroelectric order couples to the ferrimagnetism, enabling direct electric-field control of magnetism at 200 kelvin. Our results demonstrate a design methodology for creating higher-temperature magnetoelectric multiferroics by exploiting a combination of geometric frustration, lattice distortions and epitaxial engineering.